Releasing a CD is bound to be something special for those involved, so Austin band Balmorhea needed something special for the release of their new album, All is Wild, All is Silent. The band chose to use the acoustics of Ballet Austin, offering the most intimate atmosphere possible to its fans. Intimate settings can play out in various ways, as we will see shortly. Follow the jump to read our full show review. Opening the evening was The Wooden Birds, the newest project from Andrew Kenny of American Analog Set. Unfortunately, the intimate setting allowed for the various conversations of those in attendance to bounce off the walls, which was highly unfortunate, as the band definitely had something to offer listeners. The sounds were reminiscent of his previous work, but the songs felt a bit more united, as if you could easily follow along from start to finish, which wasn’t always the case with AAS. His voice still sounds a great bit like Ben Gibbard, which recalls the split release from the Home series. It was a modest performance, which would have gone over a lot better had the words of others not endlessly bounced off the wooden floors of Ballet Austin. Then came time for the night’s feature, Balmorhea. Lit by only a few sparse light bulbs resting on the floor, the six piece ensemble took to the stage, opening the evening with a piano piece, before they began the journey through the entirety of their new album. Here, the intimate setting played to the bands favor, as everyone sat on the floors, except those in the back, hanging upon every little note the band through out. Carefully working their way through the album, alternating between instruments, the band spread their soundscape before the packed house. Listening carefully, you journeyed along the empty roads of West Texas, whilst careful picking on both guitar and banjo rang through the silence of the room. Using the three piece symphony of violin, cello and bass added an extra element to the show, much as it does to the entire album. Moments of energy came and went, with one particular moment encouraging audience participation with a series of hand claps echoing throughout the room. It was one of the more endearing moments of the set, as you could tell that the band had the audience in their grasp the entire time. But, such moments were few and far between, as the band’s aesthetic is not entirely geared towards crowd participation. 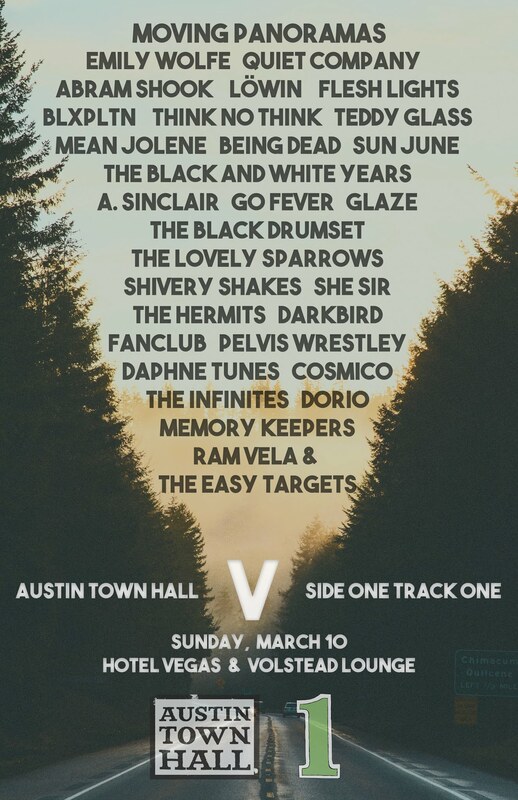 At points, the band came across as a variation on another Austin band, Shearwater. Such moments arrived when the band utilized vocals, which, like Shearwater, were quite operatic in delivery. It’s an interesting element to the bands repertoire, but one that they utilize infrequently, possibly due to the similarities; this is all fine as the band survives perfectly well on their own. Closing the night down, the band chose to end with piano, just as they opened. All remaining members gathered around a lone microphone, channeling their inner gospel choir moments, chanting in unison as the set came to an end. When all was quiet, the band was greeted with a great ovation from all in attendance; as it should have been. Photos are provided by the great Connor Davison. Say hello to him on myspace or check out more of his work over on flickr. Nice post… Good work on the photography as well Mr. Davison.